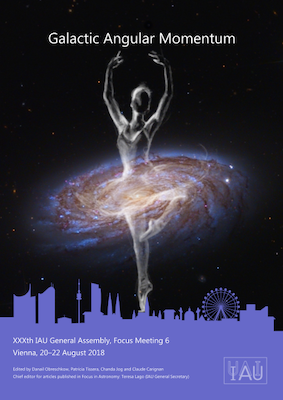 The Focus Meeting (FM6) on Galactic Angular Momentum took place from Monday 20 August to Wednesday 22 August 2018 at the IAU General Assembly in Vienna (2018). The full proceedings can be downloaded here as a single PDF-file, optimised for screen display or for double-sided printing (includes blank pages). The latter version is also available on Zenodo with the DOI number 10.5281/zenodo.1675471. In the second decade of the new millennium, observational and computational studies of angular momentum (AM) have induced major progress in galaxy evolution theory. The rich and fast evolving diversity of AM-related topics and the need for bringing observers and theoreticians together is the main intention of this Focus Meeting. Recent IFU surveys conclude that AM offers a more fundamental, albeit harder to measure, classification of galaxies than the classical Hubble sequence. The precise form of this new AM-based classification remains nonetheless a source of much argument. Many recent hydro-gravitational simulations (e.g. Illustris, EAGLE, Horizon, Magneticum, MAGICC, CLUES, NIHAO) contribute to this discussion, as do most major kinematic observing programs. Prominent examples include optical IFU/IFU-like surveys (e.g. Atlas3D, CALIFA, MaNGA, SLUGGS, PN.S, KROSS, SAMI Survey), interferometric radio surveys (e.g. at the VLA and GMRT) and many more kinematic observations on modern and future instruments (e.g. KMOS, MUSE, SINFONI, HECTOR, ALMA, NOEMA, JWST, SKA-precursors). The strong correlations between AM and morphology, as well as other galaxy properties, raise the question as to how the cosmic evolution of galaxies is paralleled, or even driven, by the evolution of AM. Answers are about to emerge from new high-z IFU observations on 8m-class telescopes, as well as from an array of cosmological simulations. Moreover, ongoing and near-future surveys are about to expand AM science to new scales: for the first time, enough spatially resolved velocity maps are available to systematically study the spatial distribution of the baryon AM in galaxies, which offers an extremely nuanced test of different galaxy evolution models. On large scales, galaxy surveys are about to become large and complete enough to test predicted weak correlations between AM and cosmic large scale structure. If you have any questions concerning this Focus Meeting, please contact Danail Obreschkow (Chair) at danail.obreschkow@icrar.org.